I couldn’t help thinking of that famous Joy Division LP cover when I took this shot: the one from ‘Closer’ featuring a grave in Genoa. 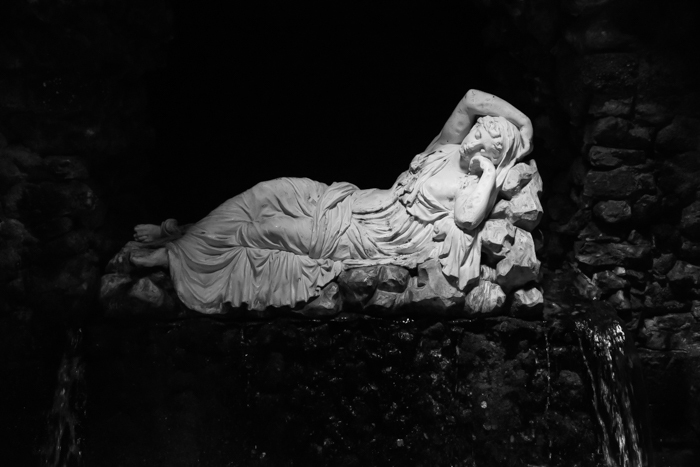 This is, in fact, a shot from Stourhead: a statue of a water nymph in Henry Hoare’s fanciful grotto. You can see the water flowing around the figure at each side. No doubt this will be instantly recognisable to the many who have been to Stourhead. Technically speaking, it was quite a difficult photograph to take. The light was very low, but there is this bright white figure within the darkness for the camera to contend with. In point of fact, I have visited Stourhead many times and photographed this same shot on each occasion, but this is the first time I have got something worthwhile. Cameras struggle with extremes of light and dark, as wedding photographers well know, having to deal with the bright white of the bride’s dress and the deep dark of the groom’s suit. Without knowing it, we scan and adjust throughout our field of vision; cameras have just one exposure with which to deal with the whole vista. However, contemporary digital cameras have come a long way and are incredibly flexible. What made this shot possible was shooting at an ISO of 1600; a level almost unthinkable in the days of film. The camera was therefore able to record the scene reasonably well and the results were correctable in Lightroom. The photograph was taken hand-held with natural light at 1/100th of a second and f4. The result still has a degree of ‘noise’ (optical interference caused by low light and high ISOs) but the effect is still, in my view, pretty good, and in its extremes of contrast, rather atmospheric.